My Thoughts Exactly Stamps: Throwback Thursday: UNITY Blog Hop! Happy Thursday!! 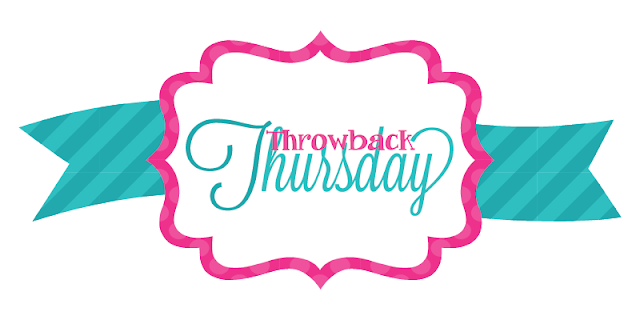 For my regular readers today is Throwback Thursday :D But guess what else today is? It's UNITY THURSDAY!!! And my FIRST hop along with the wonderful Unity design team as a guest designer :D :D :D So today I am showing off some BRAND NEW stamps from Unity along with the rest of the team. If you just stopped by my blog today you will want to go back to the Unity Blog and start the hop from the beginning! Now, for those of you who are visiting my blog for the first time through the Unity hop, WELCOME! I hope you will poke around for a bit :) To see all of my Unity projects just click on the "Unity Stamp Company" label in my right sidebar! As per usual for Throwback Thursday, I chose an OLD card I created and used it to inspire a NEW card using the NEW Unity stamps! And here is my NEW card featuring the NEW Unity Stamp Company "Hello My Pretty Friend" Itty Bitty! You DON'T want to miss this week's SALE at Unity! They're marking down ALL of the new releases from 2013!! 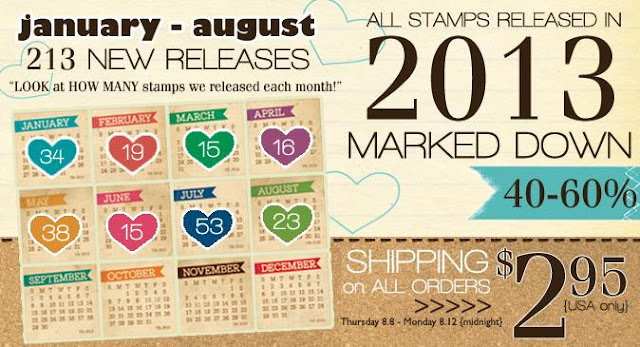 If you missed a new release sale, now's your chance to grab those stamps at a super low price! 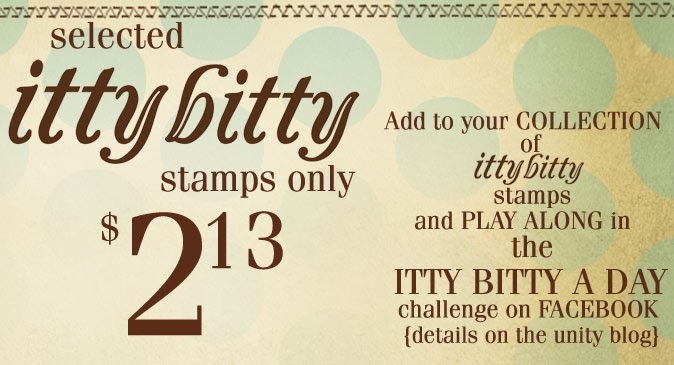 Also, many Itty Bitty stamps have been marked down to just $2.13!! AND all orders (not matter how big!!) will only cost $2.95 to ship! That's just crazy. Alright sweet friends, don’t forget to leave a comment on all the participating blogs. Three random comments from various blogs (including this one) will be chosen to receive a $20 gift certificate to Unity stamps!!! Now it's time to hop on over to the next stop! Click HERE to visit Shemaine's Blog!! Fun design, Alyssa! I like the longer card size and bright colors. Congrats again on the challenge win and change to be a guest designer. Love your card with it's bright fun colors. Congrats again, on your win! Ohh, LOVE your new, updated card! The twine is delicious and those feet, oh those feet...gorgeous! haha--LOVE those cards! and those stamps! Congrats on being the guest designer! Love, love, LOVE the bright colours! will definately be coming back to check out your blog on a regular basis. So cute! Loving the fussy cutting and the size of the cards! Soooo Adorable ... great job!!! First of all congrats on being selected as an Unity guest designer and love your card with the witches feet! What a way to start off your time as Unity guest designer! Love that card with the witchy feet. The original was pretty cute, but man oh man, I love the new one. Great job, and I can't wait to see what you do as a guest designer. Thanks for sharing! Love it. A simple design w a great stamp = magic. Oh how cute! Love that it's the hats and feet. thanks for sharing. very cute cards. They are so fun and I love the colors. I love this image and this card!! BIG Congrats on you GDT!!! LOVE the colors on your card! I love your ideas. Loved the hat card a year ago, love the feet card now! Congrats on your guest Designer spot!! And thanks for sharing your creativity with us! Great card! Congrats on being guest designer! great blog, and nice to meet you. have great day. Congrats on the GD spot! Your Halloween cards are awesome! Love those witchy feet. So adorable! Congrats on being a guest designer. That has got to be super cool! You do amazing work. wow I can see why you are guest designer.. Awesome cards. Your cards are super adorable! I think both your cards are pretty awesome! Love them! So fun! Love those feet! Love your cards. The colors are great, such fun stamps. Wonderful coloring!!!! Loved them both!!! How much,fun!!! I like the length of your card, perfect sentiment too! Super duper FUN! The new card is awesome! So is the old one. Love the long cards! Definitely too adorable! I really love those feet! That second card is sooooooooooooo CUTE!!! Thanks for sharing!!!! 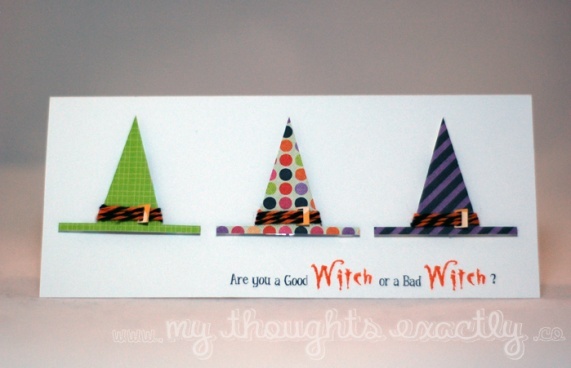 Super cute Halloween Cards! Those witch feet are adorable! Oh my both cards are beautiful. I like the bright colors and I'm happy I pick this one up. Thank you for sharing! I love the layout and size of the card! Very nice colors!